Prince George, BC- Christy Clark has announced that she will be resigning as leader of the B.C. Liberal Party, effective one week from today. In a statement released today , Clark says “It has been an incredible honour and privilege” to have served as B.C.’s Premier for the past 6 and a half years. The statement does not indicate if she will stay on as an MLA. It would be foolish to resign her seat. That would leave an immediate vacancy and give the opposition an extra vote differential. Until an individual pops up in her riding who is strong enough to keep the seat, she needs to stay in place. In fact, the new leader may not have a seat in Parliament and may have to make arrangements to run in that riding if he/she does not come from the riding. It is a good time for her to step down at this early date instead of hanging on and taking unneeded, and undeserved, flack for the party. I just hope they do not go back to a right wing party and stay in the centre/right. I was hopeful when she took the reigns. She had a centre right background. But once the money started rolling, she towed the line demanded by her backers. I’d still like to know what happened to her plans to look more closely at the run of the river IPPs. The massive debt and hollowing out of BC hydro and the fact that they siphoned money from ICBC, in lieu of taxes, left me less than impressed. good riddance.pockets lined with gold. She became stale like old bread…Krusty!! Oh, just wait until the NDP and Horgan are done… then get back to us with the Liberal hate.. In politics “every dog has it’s day”. Christy has done the honorable task of resigning. 16 years as Premier is a notable feat and nothing to be ashamed of. Even her lose was thru political wrangling, the coalition between the Greens/NDP will be interesting to watch and if they are not careful, could drive them off to oblivion. It’s their time to shine and bring forth policy that will enhance our resource filled and based economy, which I think the NDP/Greens are in left field (no pun intended) and most likely will not endure 4 years. She was only Premier for 6 1/2 years…. not 16. Simply irresponsible and lacking any foresight or leadership. Does a general walk away from a war after losing the propaganda campaign of a winning battle… leaving the field leader less in the case of renewed fighting on the battlefield? Of course not. The coalition has a razor thin virtual tie for power… a snap election could happen on day one of the legislature convening. Should that happen the liberals have no elected leader… only the leader appointed by the party insiders and large campaign donors… it’s worse than even the left wanting to appoint list MP’S appointed by party insiders. 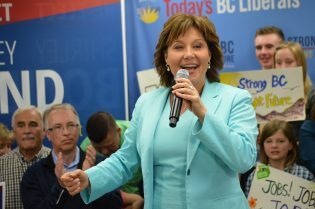 The premier has all the power and this resignation is either asking for an ndp majority in a snap election, or for the people of BC to vote for a manchurian candidate selected by the liberal donors to be our next premier. Completely irresponsible on Clark’s part and likely the legacy she will be remembered for…. leaving in a week prior to the first sitting of the legislature. Cut and run and leave the province politically to the wolves is her legacy now. Exactly, Eagleone. She is looking out for her own interests only, and apparently does not mind that she appears selfish and irresponsible. Resign as leader, yes, I have no argument with that. But to suddenly resign as an MLA representing a district in the province? No. That shows me that she does not care for the people she is supposed to represent, or the people of B.C. The tax payers, who will be footing the bill for her gold plated pension. She will be remembered as the Premier who QUIT. See will be remembered as the premier that let Rio Tinto put in a second drain! into the Nechako Reservoir. I wonder how much that cost Rio Tinto. I can only imagine what kind of effects this will have on future generations.